Talking about getting a spot close to LAX international airport? 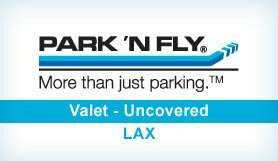 Check out PNF - you really cannot get any closer to LAX Airport than Park ‘N Fly @ Park One. Whether you're thinking about the rates, the distance, the quality of the lot, whether its indoor, outdoor, valet or self-park... If its a convenient valet service and being closest to the terminal you want look no further than Park ‘N Fly @ Park One. If you're after a premium first class service that's well staffed and puts you, the customer, as the highest priority then look no further than Park ‘N Fly @ Park One.